Put on your party hat—it’s time for another episode of Counting On! As per usual, a few of the Duggar gals are about to launch a baby Fundie from their fruitful crotches. However, before we can get to the water breakin’ fun of epidural-free labor, we will first have to endure yet another prep-for-baby episode. On this episode, Jinger and Jeremy reveal the gender (or “jender”) of their baby by making their assorted loved ones take part in a purely evil obstacle course. 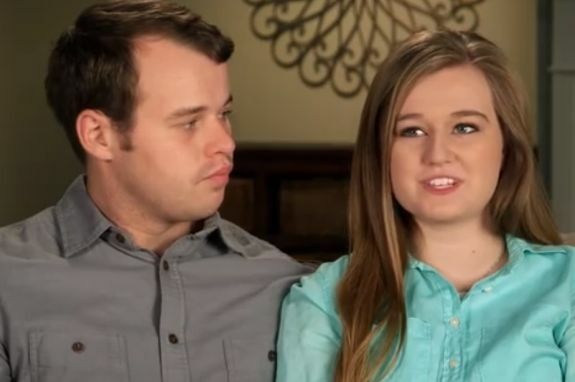 Meanwhile, Joe and Kendra are preparing for the day that a big-headed Duggar baby shoots from Kendra’s teenage loins. 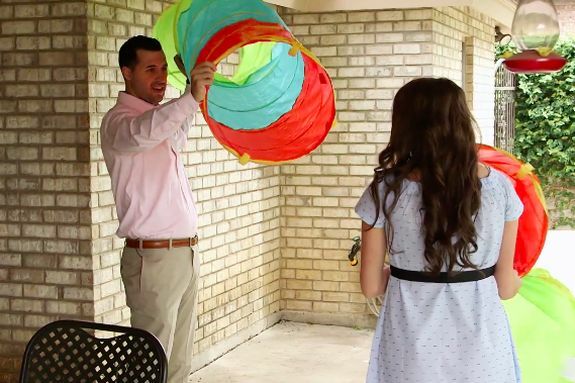 The episode kicks off in Laredo where Jinger and Jeremy are hard at work setting up a gender reveal party for their families. Jing and Jerm are planning to have an over-the-top obstacle course that their families must complete in order to learn the gender of the Vuolo baby. While setting up some tunnels that the Dugs & Co. will have to force their modestly clothed bodies through, Jeremy looks through the center of one of the tunnels and asks Jinger if Jim Bob is going to be able to fit inside the hole. Um…I think it’s fairly well-known that ol’ Papa Duggar has more than enough experience inserting himself into holes…just sayin’! Jeremy says they need to keep the obstacle course simple so people (i.e. Ben) don’t get confused about what to do. He also says the event should be both fun and embarrassing for all participants, much like watching this show itself. The two of them begin to set up random activities for their family to hop, skip and jump their way through, all while evil-laughing. 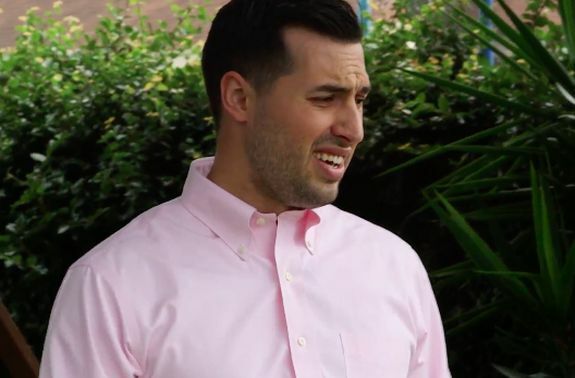 Jeremy says if he were to show up to a gender reveal party to find this poor-man’s ‘Ninja Warrior’ course, he’d be less than thrilled and Jinger agrees. Still, they’re planning to make their families do it anyway because…it’s revenge time, biotches! Kendra’s parents come over for a visit and we learn that her mom is also “with blessing”—her eighth, to be exact. 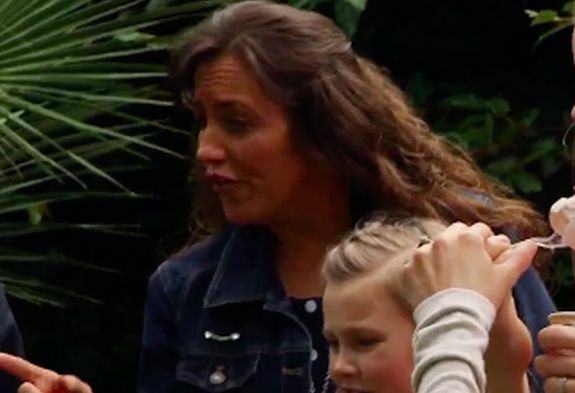 Kendra and her mother aren’t phased by the fact that usually moms and their teen daughters are only pregnant together on trashy MTV reality shows. To celebrate the fact that both of their husbands are still able to shoot viable swimmers, Kendra and her mom look through an old baby book. Kendra’s mom is excited that her new child and first grandchild— or “littles” as she calls them—will only be five months apart. Still, we get the impression that Kendra’s parents are less-than-thrilled that their teen daughter got pregnant literally as soon as she got hitched. You can tell that they were hoping that Kendra would at least make it through her honeymoon without getting knocked up. Outside the log cabin, Joe and Pastor Caldwell are hard at work installing a car seat for the baby. Pastor Caldwell (who is, by the way, still quite the Holy Hottie) tells Joe he never thought he’d be a grandfather at such a young age. 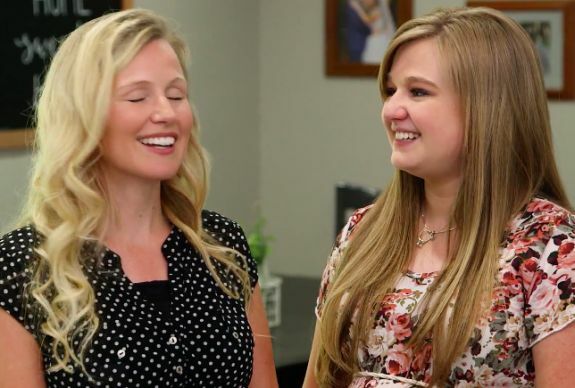 Back inside, Kendra chats about her birth plan, which involves a hospital rather than a floor mattress and less-than sterile medical equipment pulled out of Jill‘s reusable Walmart bag. Kendra’s mom is clearly taking control of the situation, unwilling to allow her daughter to end up giving birth on a well-worn birthing tarp in Michelle’s living room with a TLC camera in her face and no doctor to be found. She is making sure her daughter gets proper medical care without having to labor through 80 agonizing hours first. Kendra and her mom decide to pack up Kendra’s hospital bag, partly because it’s good to be prepared in this sort of situation and partly because they have nothing else to do with their screentime. Back at the Vuolo household, the herd of family members has arrived in their fleet of vans and immediately pile themselves inside. There are literally Dugs everywhere. He does, however, volunteer to demonstrate the course, so long as he doesn’t have to get his khakis dirty. Michelle watches in horror as Jerm explains that participants will have to crawl through the colorful tubes to complete the course. She knows that her long denim ensemble isn’t ideal for tube-crawling, so Jerm says that she can make one of her kids do the hard work for her. We all know Michelle is great at that! When it’s time for the teams to takeoff, Jeremy’s dad, Chuck, is immediately dubbed the hero of the Blue Team and possibly this entire debacle. Between downing his ice cream at a record-fast pace, narrowly falling into a pile of Duggars after some spins with the dizzy bat and even wiggling his middle-aged self through the tunnel like it’s his job, this guy is clearly in it to win it—whatever the hell “it” may be. On the Pink Team, Ben is trying his best to quickly eat his ice cream. 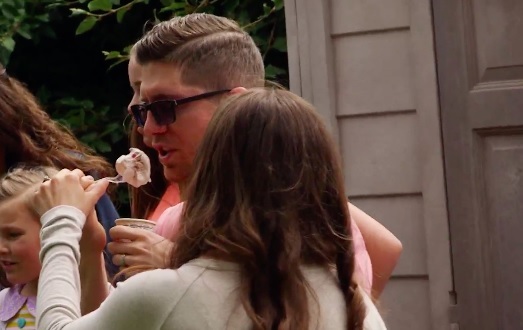 Of course, Ben’s best is not good enough for Jessa, who literally just picks up a second spoon and starts speed-shoveling the Rocky Road into her husband’s mouth, desperate to win the game. 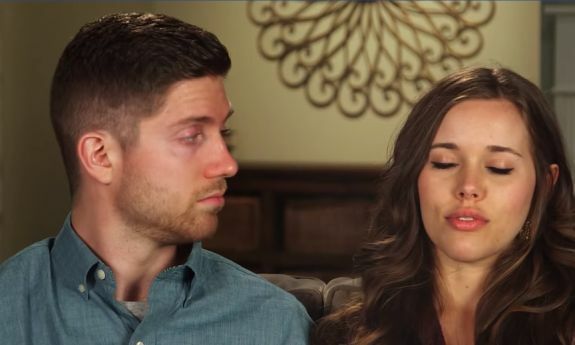 Poor Ben is basically choking on the dessert in order to please Jessa, which, if you think about it, really describes their marriage in a nutshell. Since I know the suspense is killing you, I’ll go ahead and tell you: Team Pink wins the obstacle course. This, of course, means that Team Captain Jim Bob is given the honors of pulling the string to the light that will reveal the baby’s gender. 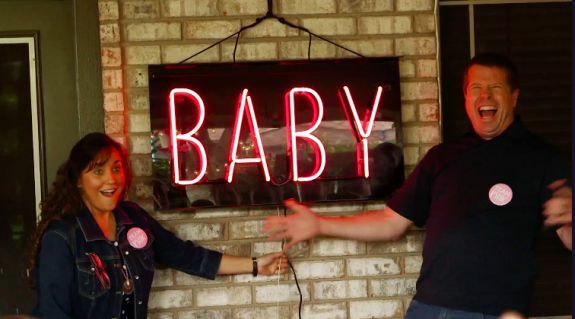 They pull the string and the “BABY” sign lights up in pink, indicating that the Vuolos are having a baby girl. Everyone is shocked, including Jessa, who looks a bit jealous that her sister gets to have a girl and she doesn’t. The baby party fun isn’t over, though! 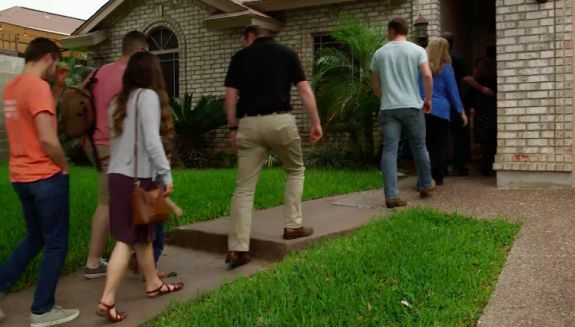 The next day, we learn that some of Jinger’s local friends are putting on a surprise baby shower for her and, since TLC already paid for the Dugs & Co. to fly to Laredo, they decide to have the shower the day after the gender reveal party. 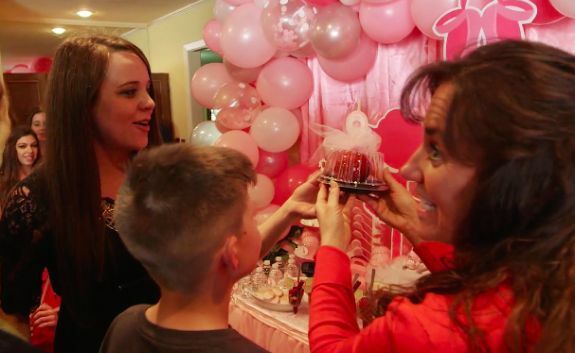 Jessa and Jana assure us that Jinger has no clue that a party is happening. 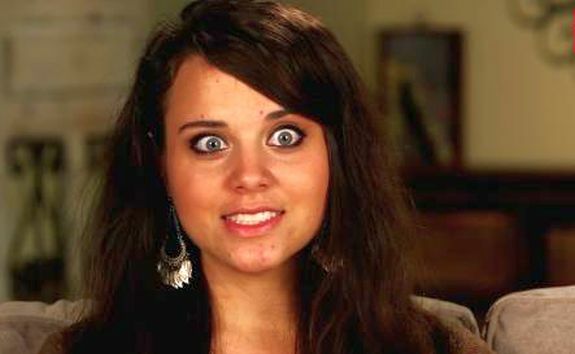 They say it will be easy to surprise Jinger because, according to them, she is clueless in general and won’t suspect anything. How sweet. Back in Arkansas, Joe and Kendra are planning to do a test-run to ensure Kendra doesn’t spew baby goo before they get to the hospital. They are planning to time how long it takes them to get there once Kendra goes into labor. 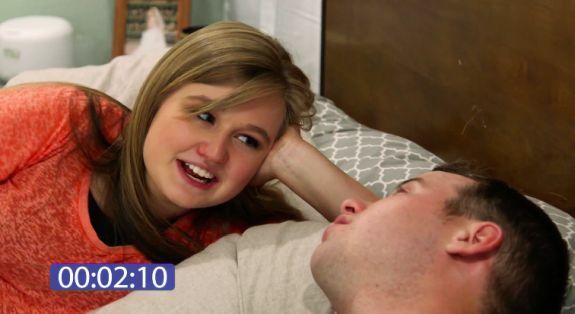 We are then treated to Kendra and Joe actually laying awkwardly on their bed, pretending to sleep (um?) so that Kendra can “wake Joe up” and let him know that there’s a baby barreling through her birth canal. Before they can go to the hospital, though, Joe goes to the cupboard and starts throwing packs of chips, crackers and cookies into his backpack. God forbid Kendra gives birth without Joe having his Ritz crackers! 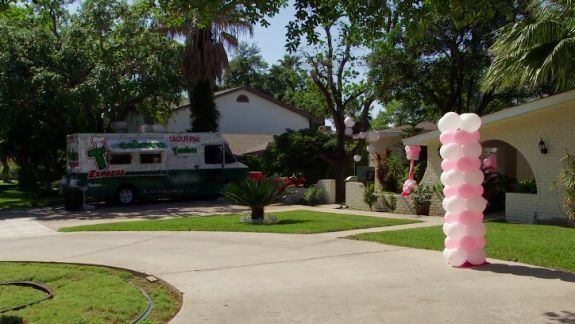 Back in Laredo, the “impromptu” baby shower for Jing is moving ahead with the help of people who are not Jana for once. 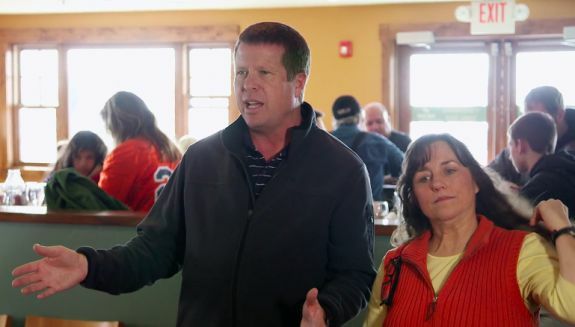 The Duggars crowd around the food table, shoveling in as much free grub as they can get their moochin’ mitts on. Seriously the kids are acting like their mom Jana has never baked them cookies before or something. After some games, gifts, prayers and food, the shower wraps up and Jinger and Jeremy thank everyone for their kindness. After the shower, Jinger and Jeremy realize that they still have to clean up all the obstacle course crap in their backyard. Luckily, though they soon realize that Jana’s still in town so she can take care of it. Phew! Thank you for watching this, so the rest of us don’t have to ? Winner or not, Chuck should have been allowed to pull the string. I loved the obstacle course! I thought Jeremy rocked it. I couldn’t believe his dad got through the tunnel. That was so cool! Don’t judge, but I actually watched about the baby’s gender reveal. 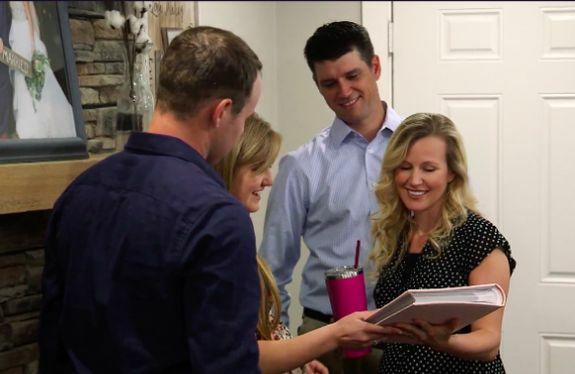 Kind of loving that side of Jeremy and Jinger. OMG, this is brilliant. Thank you both, appreciate the work. That picture with Michelle doing a hair flip was the cherry on top, they are selfish. OMG, the caption on Chuck’s photo is hilarious!!! Hahaha! Love! You kill me every time lol ?? ?